Furahan Biology and Allied Matters: Furaha in NRC again, but in English this time! Furaha in NRC again, but in English this time! 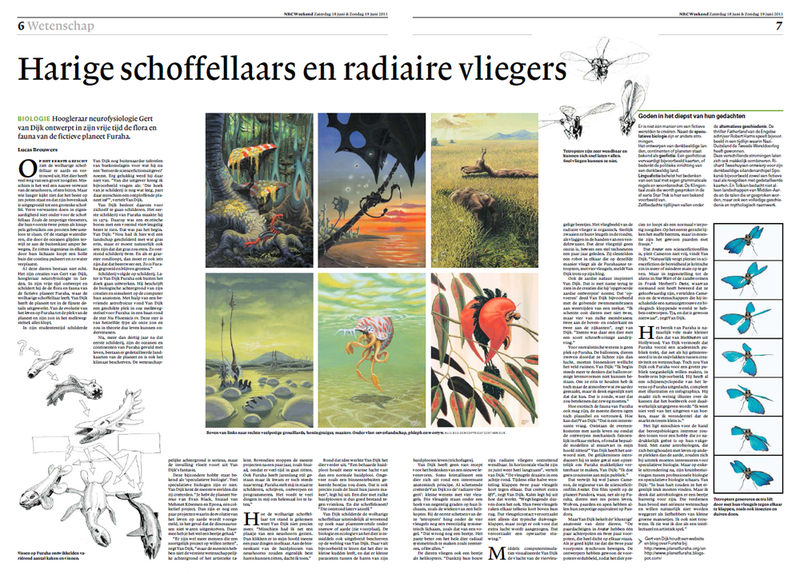 In June of this year, the Dutch newspaper NRC Handelsblad devoted a satisfyingly large section of their science section to the Furaha project. You will find the post on that subject here. As the text was in Dutch, the majority of the readers of this blog were unable to understand it. Mind you, I displayed the images at such a small scale to make it unreadable regardless of language; newspaper texts are not free, after all. But as time passes things change, so I asked Lucas Brouwers, the journalist who wrote the article, whether he would mind if I translated his text into English, and he in turn asked those in charge of such matters at the newspaper whether they would mind having the article republished in this form. The short answer was that no-one minded, so I went ahead and translated it into English. I tried to stay fairly close to the text, but at the same time wished to avoid the stilted style you often get in translations (it is much easier to write directly in a foreign language than it is to translate something from your own language into that language). 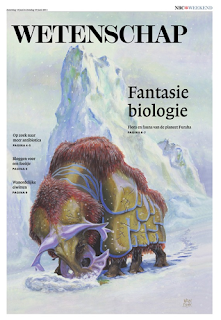 BIOLOGY Professor of neurophysiology Gert van Dijk designs the flora and fauna of the fictive planet Furaha in his spare time. At first glance the woolly-haired shuffler looks familiar. The animal looks quite a bit like a large mammal. It might just be a close relative of a rhinoceros, or a bison. But a closer look reveals that it is standing on six legs and that its upper jaw has grown into a grotesque shovel. Its more distant relatives are no less odd than the shuffler itself. There are six-legged predators, using their two front legs to knock their prey unconscious with. Or how about water animals, gliding solemnly through the oceans with hardly any moving parts visible from the outside. They are ingeniously designed: a hollow tube runs through their body, displacing water by pulsating continuously. None of these animals are real. They are creations of Gert van Dijk, professor of neurophysiology in Leiden. In his spare time he designs the flora and fauna of the fictive planet Furaha, home to the woolly-haired shuffler. Van Dijk designed the workings of his planet in minute detail. From the evolution of life on Furaha to the place of the planet and its star in our galaxy: it is all there. 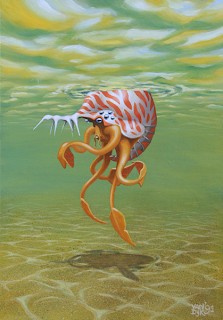 As a student Van Dijk used to paint extraterrestrial scenes for book covers for a publisher of what he now labels as "atrociously poor science fiction" The work did not make him exactly happy." That publisher asked me questions like the following: 'There is an empty corner in your painting; couldn't you fit in an exploding planet there?' ", he recollects. Van Dijk therefore decided to start painting for his own pleasure. The first painting showing life on Furaha dates from 1979. It showed an exotic tree with an odd four-winged beast. That was only the beginning. Van Dijk: "Having painted a landscape with lots of grass in it, there obviously had to be something to eat all that grass. That was the start of the second painting. Well, once you have a animal eating plants, you are bound to need something to eat that animal in turn. That is how Furaha grew, and continued to grow." A series of paintings followed. Later on Van Dijk started elaborating Furaha in other ways than using a painter's canvas. He writes essays on the biological background of his creations and simulates their anatomy using a computer. An astrophysics friend helped him to find a suitable spot in our galaxy for Furaha: in orbit around the star Nu Phoenicis IV. This star is of the same type as our sun and could therefore in principle support life. Now, over thirty years after that first painting, the oceans and continents of Furaha are filled with life, there are detailed maps of the planet as well as descriptions of its climate. While there is a serious scientific background to the work, shaping the world flows from Van Dijk's fantasy. This unusual hobby is known as 'speculative biology'. There aren't many speculative biologists. Van Dijk is familiar with most of the worlds they created. "There is the planet Nereus by Evan Black, there's Snaiad by Mehmet Kösemen and Epona, a collective project. There are a few projects dealing with the evolution of life on Earth in case the dinosaurs would not have gone extinct. That's largely it." "There are certainly more people who wish to start a similar project", Van Dijk says, "but most do not combine a scientific background with artistic talent. Moreover, most projects stop after a few years' such as Snaiad, for the simple reason that they take up so much time. In fact, I stopped working on Furaha for years on end, but kept getting back to it. Fuaraha allows me to paint, write design and program. It meets to many of my needs to let it go." How the woolly-haired shuffler came into being he no longer remembers in detail. "It's possible I had recently been looking at pictures of a rhinoceros. Things may just click together in my head. The inside of the skin folds of rhinos could well be covered in hairs, I may have thought." That was the basic concept around which the animal took shape. "A skin fold covered in fur would be able to trap more warm air than one without hair. A fur coat, turned inside out, would have the same effect. That is in fact how the Inuit put their fur coats together", he explains. An animal with such furry folds would be able to deal with below-zero temperatures. And its shovel for a snout? "That evolved by itself". In the end, Van Dijk painted the woolly-haired shuffler while it was upturning snow or soil in a search for plant roots or anything edible (see the cover). Its biology and ecology have been described in detail on Van Dijk's weblog. For instance, that says that the animal lives in small herds, and that that are small parasites living in the fur of its skin folds (trichophages). Van Dijk does not use any fixed recipe to come up with a new life form. Sometime an animal crystallises around an interesting biological principle. 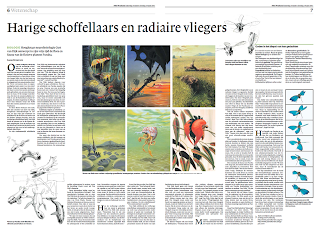 The 'radial flyers', small creatures with four wings, came into being while he was sketching. Their wings are placed at an angle of 90 degrees to their body, like the blades of an helicopter rotor. The first sketches of these 'tetropters' showed a bilaterally symmetrical body , like a bird's, hanging under the wings. "That did not feel altogether right. I then thought it better to make the entire animal radially symmetrical, such as starfish or jellyfish." In flight, the animals look a bit like helicopters as well. "Thanks to their design they have excellent manoeuvrability, but they aren't that fast in horizontal flight", Van Dijk explains. "The wings move in a figure eight-like pattern. A wing briefly beats against another one twice in every movement cycle. This creates additional lift". He explains calmly how this works. "Pigeons taking off do the same thing. Their two wings beat against one another above their backs. The contact between the wings does not only cause the characteristic sounds of pigeons taking off, but also causes extra air to be sucked in, and that generates an upwards force." Van Dijk visualised the flight of these four-winged little creatures with computer simulations. The resulting flight of these radial flyers look looks organic. Their wings swing gracefully to and fro, rather like flags in the hands of a flagthrower. This mode of flight actually makes sense, as was proven by engineers a few years ago. With some pride Van Dijk wrote on his blog that they built a flying robot with four wings, flying in exactly the same manner as Furahan tetropters. Another source of inspiration is nature on Earth. This is most apparent in those creation he labels as 'supercharged Earth designs'. One example of supercharging was his take on the undulating membranes of squids. "I started sketching animals with not two, but four of such membranes: two at the top and bottom, and two at the sides. From that design an animal emerged with a screw-like propulsion system." There is no place on Furaha for unrealistic creatures. Ballonts, creatures that float by virtue of being lighter than air, may be struck from the record soon. Van Dijk: "I am beginning to think that balloon-like organism are not going to work. To keep them in I already increased the density of the atmosphere, but I do not really think that that is enough. That is a pity, because that would mean I have to abolish them." No matter how exotic the Furahan fauna may be, most animals still look plausible and familiar. Why is that? Van Dijk: "That is an interesting question. Is the resemblance with life on Earth the result of a workable biomechanical design, or because many design models are simply prewired in my imagination?" He does not have the answer. One thing is certain, and that the resemblance is not introduced on purpose to make Furaha more palatable to his audience. Van Dijk: "I do not make any concessions to what people might like". Making too many concessions is something he blames James Ccameron for, the director of the science fiction movie Avatar. Avarar takes place on the moon Pandora where there are six-legged animals, just like on Furaha. Wolves, horses and monkeys all have six-legged analogues on Pandora. Van Dijk criticises their 'awkward' anatomy. "The horse analogues in Avatar have one pair of hind legs and two pairs of front legs, placed very close together. If you look carefully you will see that the two pairs of front legs move in synchrony. The designers simply doubled the front legs, so the animal looks in exactly the same way as a four-legged animal. At first glance they look cool, but essentially they are just horses with added frills." The fact that Avatar is a science fiction movie is no excuse, Van Dijk thinks. "Of course, enjoying science fiction requires a degree of suspension of disbelief. But no-one ever claimed plausibility for the aliens of Star Wars or the sand worms of Dune, in contrast to what happened with Avatar. Cameron and scientists he hired claimed to have developed an accurate and biologically plausible world, and they simply did not. ", Van Dijk says. Obviously, Furaha reaches a fraction of the people of a Hollywood blockbuster. Van Dijk supposes that Furaha mainly attracts people with a higher education, interested, like he is, in what happens in the intersection of science and the arts. Still, he would definitely like to widen the readership of Furaha, for instance by publishing a book. In fact, he already posted a fake encyclopaedia of life on Furaha, including illustrations and infographics. He doesn't think there is a good chance of it getting published: "I do not know much about publishing books, but I guess that the market for such a work is very small." You would expect professional biologists to be interested in a hobby that is so closely allied to their area of interest. Astrobiologists, dealing with the science of life on other planets, in particular might show an interest. But, apart from a rare exception, cross pollination between biologists and those working in speculative biology seems not to happen. Van Dijk: "They ought to like it in their heart of hearts. But perhaps astrobiologists do not wish to be associated with speculative biology. They are dealing with serious science and may prefer not to be to be portrayed as believers in little green men. Neither do I, by the way. I regard what I am doing as an intellectual and artistic game." - (Right top) Tetropters generate extra lift by clapping their wings together in the same way insects and pigeons do. - (Far right) Tetropters are very manoeuvrable and can let themselves drop very quickly. They cannot fly fast. Wow, thank you so much for taking the time and effort to translate this! I hope the article improves your prospects for getting published. The new pictures are a real treat, especially the mysterious pleph; how does it relate to the other creatures on Furaha? How does it propel itself through the water? The worryw also intrigues me. It looks like an avian, but appears to have only one pair of wings. Is this an example of secondary limb loss? You are a real motivation to me seeing how much scientific thought, time, and artistic skills you put into creating Furaha and its inhabitants. I especially like the last creature you pictured at the end of this post. It reminds me of a Pokemon but looking realistic at the same time. Your work defiantly deserves a book or even a documentary. Keep up the good work ;). A little off topic but In your opinion, could an organism like a gulper or a pelican eel evolve into a large filter feeder in 15 million years time? Oh, and did you have a chance to see that episode of "Through The Wormhole" that I brought up in a different thread? When I told my wife's family about the fact that my name was dropped in this article they got really excited, thinking that I was internationally famous or something. I tried to explain the fact that this was Furaha's spotlight, but for some reason it was difficult for them to understand. i love the phleph. an ammonite analog with squid like tentacles and catfish like mouth? a neat mix. i'm guessing it swims by beating it's tentacles like trieme oars, and that gas pockets in the shell give it bouyancy. i'm also guessing it's a bottom feeder given the mouth shape. Spugpow: there are quite a few groups of animals on Furaha that cannot be related to others on sight. In some cases because they actually have a different basic body plan, and in others because of vst evolutionary changes. look to life on Earth with a fresh eye: do a mussel and a squid look related? Do a whale and a giraffe? The 'worryw' was only called that in the newspaper article because I had shortened the name of the image file from 'worrywallah' to 'worryw'. 'Worryw' is probably better. In truth, it is one of several painting that were more humorous than serious. Christian: Thank you. About the pelican eel evolving into a filter feeder. I guess so; It would be one of the 'gulping' variety of filter feeders that take use mouthfuls of water at a time and process them, with the water going out the same way it went it. The alternative is water going in at one point and out through another. But you should ask yourself what the pelican eel has not already done so; is the niche already taken? Is ther not enough gain for it to take this route? Perhaps not; it does not seem to live in regions with plentiful prey to sieve out of the water. Evan: well, you are world famous! It is just that you (or I) are not known by vast numbers of people around the globe, but instead by a select minority of people. Still around the globe though. Surely the words 'world famous' allow for this insignificant departure of what people seem to think the words mean? Mithril: thank you. The phleph can indeed regulate its buoyancy aided by gases in its shell. 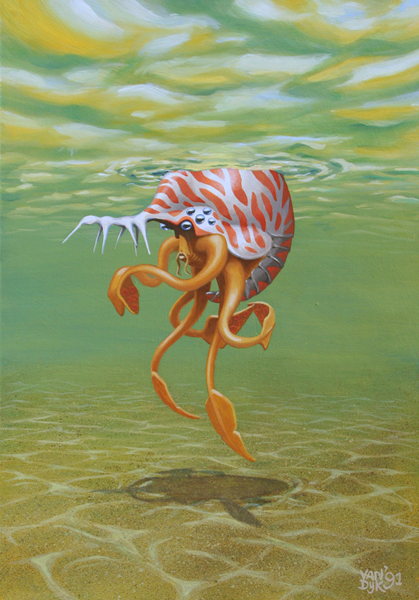 Its lifestyle is a bit like that of a nautilus: it's there, it eats, swims, and that's about it. Its Latin name means 'Vanity upwards bound due to a lack of weight'. Sigmund: Thanks for responding to my question. BTW, I do think that the niche of filter feeder is currently occupied but the organisms that fill those niches will probably go extinct, allowing the pelican eel (and other deep ocean organisms) to slowing rise closer to the surface and eventually fill some of those niches (I also found that the pelican eel's diet consists mostly of small crustations so they are pre-adapted in a sense).